Michele Martinelli, can be defined as a pitto-sculptor, for his particular material technique. 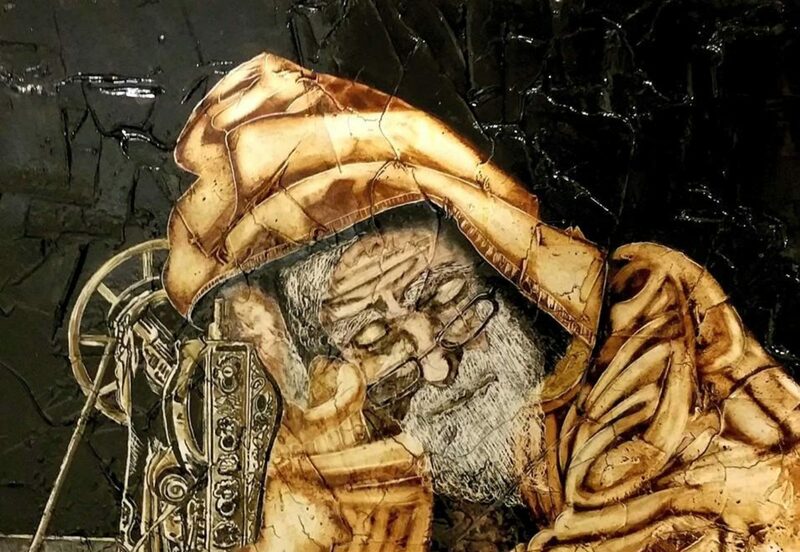 The artist paints in watercolor and tempera on an amalgam of resin elaborated and invented by himself, which is spatulated irregularly on a wooden board and subjected to various thermal processes and a final polishing, thus obtaining a surprising asymmetric appearance with a particular luster reminiscent of glass and ceramics. The Perugian artist brings his art and Umbria beyond national boundaries, exhibiting in the prestigious halls of the Carrousel Du Louvre in Paris, Palazzo Heysel in Belgium, Palace of the Cannes Film Festival in France, Germany, Bulgaria and Czechoslovakia. His works are on permanent display at the UN headquarters in Rome, the headquarters of FAO and the headquarters of the World Food Program. The works on display are bas-reliefs depicting the “Lion” and the “Winged Bull” of Babylon commissioned by SE Saywan Barzani, Ambassador of Iraq to the Italian Republic and Ambassador to the FAO and the Ambassador of Iraq to the Holy See of the Vatican. One of his works “Mamma Africa” ​​was commissioned by the University for Foreigners of Perugia and donated to the Ambassador of the Republic of the Congo, African Dean of the Diplomatic Corps at the Quirinale. Michele Martinelli is co-founder with the curator who follows his artistic career Alessandra Anca Palel, of the international traveling event “Peace paths and paths of awareness. The cultural movement involves artists from various countries, making art a message of peace, a flag for communication between cultures and peoples, collaborating with various embassies and representatives of the institutions.